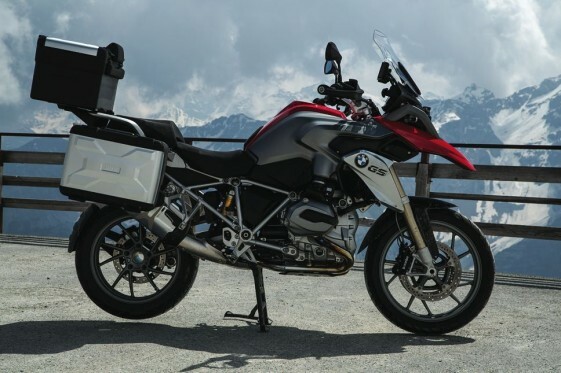 The BMW R1200GS has been at the top of the Adventure Bike food chain for years now. But the competition has been closing in offering similar features and performance. With improved power, water cooling and electronically controlled suspension settings, BMW has raised the bar even higher with the 2013 BMW R1200GS. With KTM releasing it’s new 1190 Adventure and Ducati’s improvements to the Multistrada, everyone wants to know if the bar was raised high enough for BMW to still retain it’s seat on the throne. In the October 2013 issue of Motorcyclist Magazine story “Ultimate Alps Adventure”, ten riders won a Guided Tour of the Alps in a joint production with Edelweiss Bike Travel touring company. Winners had an opportunity to ride five of the top adventure bikes on the market. Along with the 2013 BMW R1200GS, the other bikes tested were the Yamaha Super Tenere, Ducati Multistrada 1200S, Honda Crosstourer, KTM 1190 Adventure (and the Adventure R), and the Triumph Tiger Explorer. The lucky trip winners and magazine journalists embarked on a five day tour of the Alps through Austria, Italy and Switzerland. The overall opinion of both trip winners and moto journalists alike was that any of the bikes would be awesome if you never rode the GS. The new water-cooled 2013 BMW R1200GS was the clear favorite of the group over a variety of paved and off-road travel conditions. The 2013 KTM 1190 Adventure came in second with high marks for its off-road capabilities. 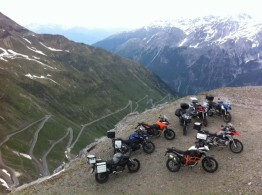 All riders were astonished by the beauty of the alps and the variety of amazing roads. For some, the trip was a life changing experience. The story also underlined the advantages of being part of an organized tour with expert guides as the group was treated to secret mountain passes, incredible food and the opportunity to test several different motorcycles. Check out the story “Ultimate Alps Adventure” in the October 2013 Issue of Motorcyclist Magazine. Dual Sport or Adventure Bike — Which is best for you?